The month of February 1945 will be indelibly printed in our minds as an extremely important month in the history of this group. In our last month’s narrative, we vowed with determination that, weather permitting we would pass the 200 mission marker within an operational period of one year. Adverse weather hindered our operations during the early part of the month, and this with the knowledge of the short month made some of us feel as though we were doomed not to accomplish our goal. However, on 21 February we started a streak of flying which did not end until 5 March. In other words, 13 straight, uninterrupted days of flying, which certainly aided in accomplishing the coveted prize. We completed our 200th on 26 February with a raid on “Big B”, a fitting target for this memorable occasion, and went on to rack up two more and ended with a score of 202 missions in exactly 344 days of operational flying. We know that this is not a record, but it certainly is an achievement to be proud of, and needless to say every man on the base seemed to have extended their chests at least a good inch. 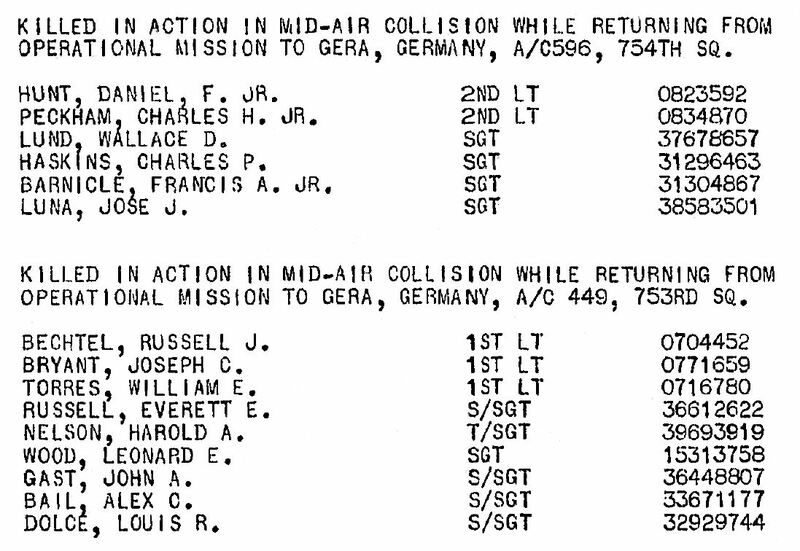 It would be quite simple to go on and on relating statistics as part of this narrative, but thanks to our statistical section and the excellent work of LT JOSEPH S WILLIAMS and SGT (now 2ND LT) JACK STOLZ, a complete statistical analysis of the operations of the group from 2 March 1944 to 28 February 1945 is appended. We believe that these cold figures will give a much clearer picture of the group’s achievement than could be written up in narrative form. We fully realize that this excellent record could never have been accomplished without the untiring efforts of not only the combat personnel, but of those on the line, the mess halls and in the offices. Our first mission of February was on the 3rd when we were assigned as a target, our old friend, the ROTHENSEE OIL REFINERY at MAGDEBURG. Although this target had been attacked many times, it was still believed to be operating at about 75% normal capacity, and it was up to us to decrease this output of the very much needed fuel going to the Wehrmacht and Luftwaffe. Maximum effort was called for, and we answered by putting 41 A/C in the air under the leadership of MAJOR BETZOLD and LTS. BLUM [left], BOWERS, ELLIS, and EISERT. Plans called for an attack on this target by visual methods only, but while on the bomb run 6-8/10ths cloud prevailed and it did not look like a visual run could be made so the code word was changed to an attack by visual means with an H2X assist. Twenty-one A/C dropped on the primary with unobserved results due to cloud coverage. Eighteen others attacked a Target of Opportunity at WESERMUNDE by H2X methods with unobserved results. One A/C attacked VECHTA A/F, whilst another attacked OSTER KAPIN with crews reporting hits in center of town, however, no photo coverage was obtained. Total bombs dropped on these targets 374x500 GP’s and 3x2000 GP’s, and another mission was added putting us up to 187 with 13 to go for the 200. We were not again airborne until the 6th, when once again we were back at MAGDEBURG (some pilots claim that we have been to this unfortunate city so many times, that they could fly to it blindfolded) only this time it was to be the M/Y instead of the oil refinery. Once again we had to resort to instrument bombing due to the existing cloud cover. The group, leading “B” wing of the Division, put 36 A/C over the target under the leadership of LT COL WILLIAMSON, CAPT BLUM and LTS. CHIMPLES and ANDERSON. Before the I.P. the code word was received for an H2X attack. The H2X set in the lead A/C went out on the bomb run and although the H2X set in the deputy lead had been fading, it came back in so they took over when about 15 miles short of the target. There was not much time for a good bomb run but the target was picked up. 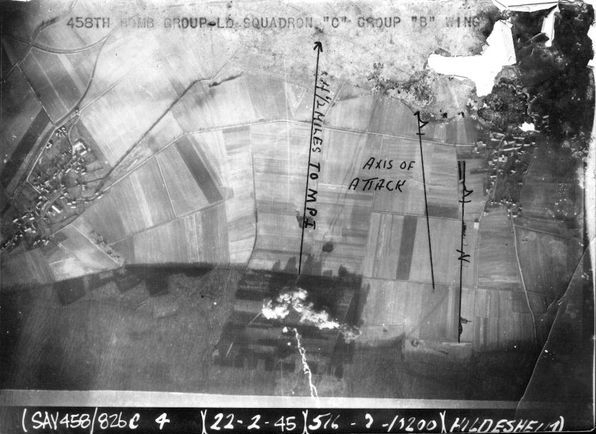 Bombs were dropped to the left and short of the smoke markers of the group ahead. The undercast was solid and results could not be observed. The lethal load dropped on hapless MAGDEBURG was 334x500 GP’s and 2x1000 GP’s. SORTIE No. 188 was chalked up on the black side of the ledger. Around this time of our operations we were running into what might be called a number of plans. After being alerted, in would come a field order labeled “Plan A”, then another “Plan B” or “C”, necessitating twice the work for the intelligence section. An equal number of battle folders would have to be made up for each plan. The briefing officers would have to study and be prepared to brief on either plan. Often it would not be known what plan would be used until briefing was under way. And on the 9th of February we ran into this situation. “Plan A” called for a visual attack on the ROTHENSEE SYNTHETIC OIL PLANT at MAGDEBURG, whilst “Plan B” called for an H2X run on the M/Y’s in the same town. We were again to be denied the pleasure of a visual run as there was 10/10ths cloud coverage over the primary and our group of 34 A/C led by LT COL O’NEILL, MAJOR PHILLIP, CAPT WILLIAMS and LT DYER, were forced to attack the secondary planned target by H2X. There was 8-9/10ths cloud on the bomb run, but the river was picked up through a hole and the bombs were in the target area. Damn the weather! However, SORTIE 189 was credited with 11 more to go for the 200 marker. On the 11th we dispatched a small squadron of 10 A/C to attack the important WESEL BRIDGE over The Rhine River. This was a delicate operation and could be attacked only by visual means. If visual conditions did not exist our secondary was the FUEL DEPOT at DULMEN. We don’t think we will have to go to any great length to keep anyone in suspense as to what target we were forced to hit. Of course it was DULMEN by H2X. LT POLLIARD led the 8 A/C remaining in the formation over the secondary, dropping 46x1000 GP’s on the smoke markers of the group ahead with unobserved results. February 14, 1945 - A group of bombs are barely visible against the undercast in center of picture. 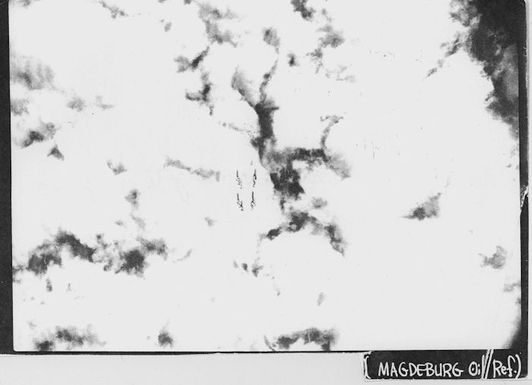 Again on the 14th we had to pass up bombing our assigned primary, the OIL REFINERY (ROTHENSEE) at MAGDEBURG, and instead drop on the secondary, the MAGDEBURG M/Y. Our formation of 28 A/C were led over the target by MAJOR SPEER and CAPTS BLACK and BRECKENRIDGE dropping 111x1000 GP’s plus 50 M-17 IB’s with unobserved results due to the 10/10ths cloud coverage. Still after MAGDEBURG/ROTHENSEE due to the fact that, although being bombed a number of times, it was still #3 on the priority list and was still capable of producing 10,000 metric tons a month which amounted to 50% of its original output before being bombed. So, on the 15th we were once again over Germany, placing 36 A/C led by MAJORS BREEDING, RUE, PHILLIP and CAPT QUINN over the OIL REFINERY and dropping 409x500 GP’s with the following results: SAV’s obscured by cloud. Crews feel the run was good, but may have dropped a little over. It was reported that after leaving the target area, black smoke was seen billowing up into clouds at about 10,000 feet, and we can readily guess what that means. Only eight more to go. Emphasis seemed to be placed on the Hun’s transportation, as it can be readily seen that the targets so far attacked this month, M/Y’s, were in the majority. And this continued true as on the 16th we were assigned the M/Y at OSNABRUCK which photo recon showed to be exceptionally active, therefore meriting a visit. MAJOR BOOTH, CAPT BRECKENRIDGE and LT MORAN led our three squadrons and placed 26 A/C over the target, dropping 317x500 GP’s with the aid of GH equipment. It was brought out at the critique that this was one of the best GH bomb runs ever made. After analyzing the SAV’s, our P.I. Officer stated that the first section’s bombs scattered between 1000 and 3000 feet south and east of the MPI, whilst the second section’s bombs fell 14,000 feet northwest of the MPI. It was determined that the second squadron dropped 20-30 seconds early due to a malfunction that may have been caused by the invertors coming back in suddenly. After two days of poor weather, we were again airborne on the 19th with an attack on a FOUNDRY and CASTING PLANT at MESCHEDE, which produces in great quantity castings for Jet propelled A/C. Again we had to resort to GH bombing, and the 29 A/C of our formation dropped 165x500 Mark 12’s and 156 M-17 IB’s with unobserved results. Credit for leads this day went to LT COL WILLIAMSON, CAPTS BRECKENRIDGE and BLACK. Six more to go! In those far-away days known as peacetime, the city of NUREMBURG was noted for the manufacture of children’s toys, and also for its marvelous Gothic architecture, but when the Nazis came into power this once peaceful city became the seat of Nazism. Here the great Party gatherings were held in the tremendous stadium and here fostered the creed of the Nazi Party. But now, Nuremburg, instead of producing toys, was manufacturing tanks and other implements of war. So on 21 February, we paid a visit to this important target and were assigned as our MPI the MAIN RR STATION which was reported to be jammed with rolling stock ready for shipment to the front. A total of 352x500 GP’s were dropped by our formation of 37 A/C led by LT COL O’NEILL, MAJORS RUE and PHILLIP and LT WILLIAMS. Once again we had to resort to H2X bombing and results were unobserved. However, our H2X operators all agreed that they had a good run and were positive of being over the target. We feel sure of good results this day as up until the end of the month there has been no request by the VIII AF for a repeat call on this Nazi incubator. February 22, 1945 - Bombs from one squadron fall far short of the target in this strike photo. And now we come in on the home stretch and starting on the 22nd we ran a mission each day for the following 12 days. In a maximum effort against the Hun’s RR facilities, the VIII AF, in conjunction with the RAF, was out in full scale. Our efforts called for a two-prong attack on two M/Y, namely, PEINE and HILDESHEIM near HANOVER. We dispatched 38 A/C under the leadership of MAJORS BREEDING, BOOTH and LTS POLLIARD and CHIMPLES, but our total A/C attacking was 34. Our results this day might be classified as fair, as our P.I. Officer rates our bombing as follows: 16 A/C, PEINE M/Y visual. Crews report good hits in M/Y and adjacent factory buildings. SAV show two patterns 2500 feet south and 7500 feet SE of MPI with some hits on factory area and rail line E of MPI. 18 A/C HILDESHEIM M/Y, visual, crews from one squadron report hitting short in woods while those from the second report good pattern in M/Y with large fires. SAV show patterns 4-1/2 miles short of MPI in forest area, and 6000 feet south in small M/Y on eastern side of HILDESHEIM. Only four more to go! Our old friend BIELEFELD M/Y was to receive a visit from the 458th on 24 February. The formation, led by LT COL HOGG, CAPTS BLACK and BRECKENRIDGE, led the Wing on this mission dropping 298x500 GP’s with the following results: 25 A/C attacked BIELEFELD, tertiary target by H2X with a visual assist. Cloud coverage prevented accurate observations but most crews believed numerous hits were made in center of town. One A/C attacked LASTRUS (5247-0752) opportunity target by visual method, results unknown. One A/C attacked BAD ESSEN, opportunity target by visual method, results unknown. Photo coverage reveals bursts 800 feet south of MPI and a pattern from MPI to the east thereof. Clouds limited accurate coverage, but believe results to be fair. Two more to go! At last on 25 February we were favored with some fine weather and were able to bomb visually and see the results of our efforts. The A/F, SWABISCH-HALL engaged in major training and refitting as well as assembly of JET A/C was to be our victim of the day. MAJOR RUE, CAPTS WILLIAMS and GOODFRIEND led our 27 A/C over and all 27 bombed the target visually dropping 258x500 IB’s with very good results. On the bomb run a GH run was started. The middle third of the bomb run was covered with clouds. However, the target area was picked up visually when 14 miles out and the GH Operator turned the A/C over to the Bombardier. The MPI was sighted from about 8 miles away. All three squadrons had good runs. A good job done and something to be proud of. 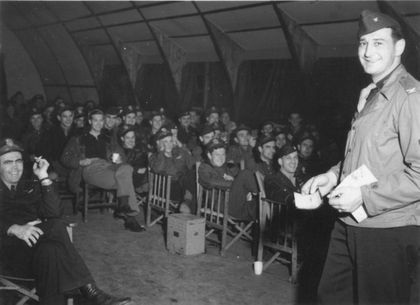 February 26, 1945 - Col James Isbell (Group CO) briefs the combat crews for Berlin. 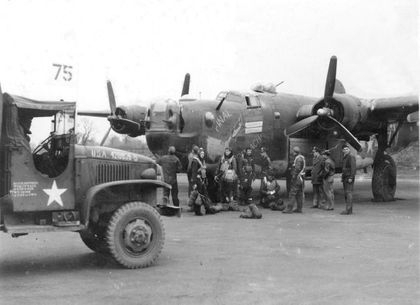 At right, Lt Burman's crew prepares to board Final Approach. We had waited a long while for this day and when it finally came our joy was unbounded. 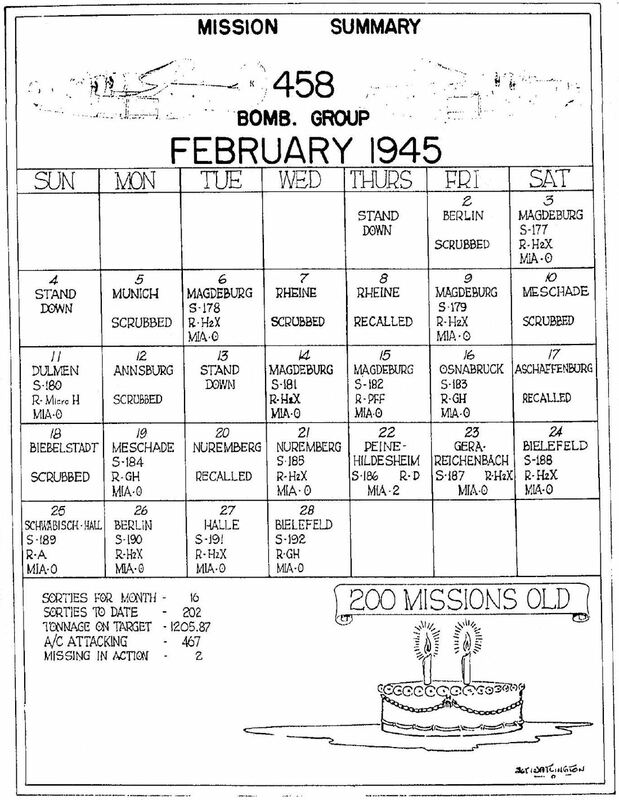 Just think, 200 missions in less than a year in operation, and just think of the big celebration that was planned. As a fitting target for this occasion we were given on a silver platter the biggest of them all, “Big B” making our eighth visit to “the daddy of them all”. This day Berlin was to feel the tremendous might of the entire Eighth Air Force and this attack was one of the severest this city has undergone. For those of us who saw the newsreels of this attack, the only thing we could say was, “Thank God I am not German.” Our MPI was the RR M/Y TERMINUS in the NE portion of BERLIN, and our purpose – to destroy communications and built up area 1-1/2 miles NNE of FRIEDRICHSTRASSE Station and the River SPREE. Twenty-five of our A/C led by MAJOR PHILLIP, CAPT MATZE and LT ELLIS dropped 138x500 GP’s and 75 M-17 IB’s by H2X technique with unobserved results. However, it was definitely determined that the H2X operator brought the formation directly over the target area. PRU coverage later on showed this to be one of the most devastating attacks on the German capitol, and a fitting mission for the group as its 200th mission in the ETO. As the formation returned to base, nearly everyone who could manage to be on the line were there to greet the boys when they came home. 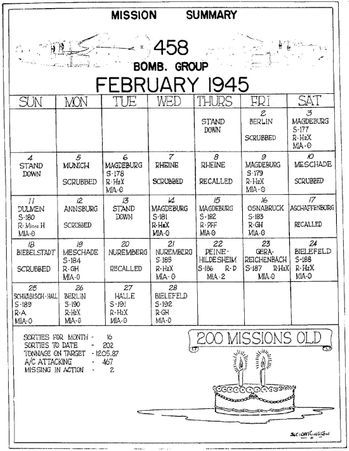 The first mission on the way to the 300 marker was our attack on the HALLE M/Y on the 27th. This important M/Y is situated 16 miles NW of LEIPZIG and is one of the three main routes running SW from BERLIN, and therefore an important cog in the German RR installations. Led by LT COL WILLIAMSON and CAPTS BLACK and BRECKENRIDGE, our formation of 26 A/C attacked the primary dropping 421x250 GP’s and 46 M-17 IB’s by H2X technique with unobserved results. Still in an unbroken streak of flying, we were up again on the last day of the month, putting 27 A/C over the town of BIELEFELD and dropping 154x1000 GP’s by GH methods with unobserved results. The honors for leadership go to MAJOR BOOTH and LTS ALLEN and HEALY. The GH equipment worked all right and a good bomb drop was made. 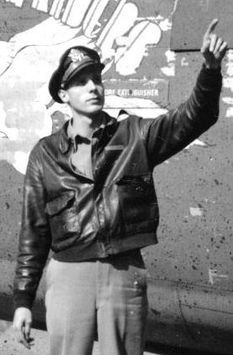 And thus rings down the curtain on one year’s activity for the 458th Bomb Group in the ETO.